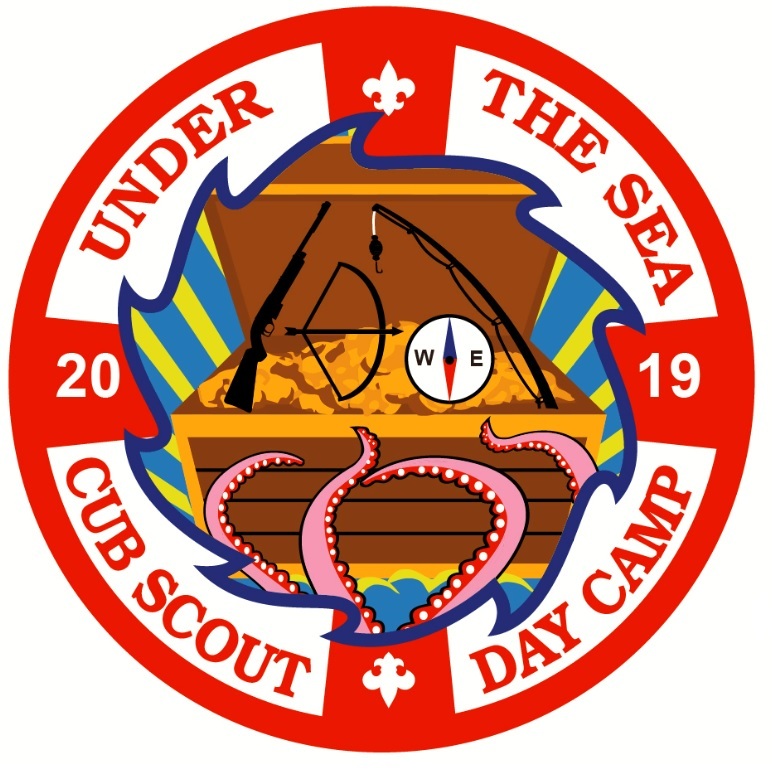 "Under the Sea” is the 2019 Day Camp theme. Enjoy all the traditional Day Camp games, crafts and activities and learn about all sorts of amazing things in and around the water!. Scouts will have plenty of fantastic adventures at Day Camp, some of which may include shooting bb guns and archery, play games, building a special game box, singing songs, doing skits, and most of all HAVING FUN! We will fish, do a woodworking project, shoot BB guns and Bows and Arrows, have lots of games and activities and much more. The Cub Scout Day Camp program is both a fun and educational event offered each summer to potential Cub Scouts, Cub Scouts and Webelos who want an exciting 1-4 day event. Some of the activities that are held at camp will give the Scouts an opportunity to earn some achievements towards their rank advancement; other activities will be for the fun and enjoyment of the outdoors. A team of volunteers in your district is busily planning a fantastic camp for 2019. Cub Scout Day Camps in the Great Rivers Council are conducted by trained and certified directors who use the standards as set by the Boy Scouts of America to ensure a quality program is being offered. Cub Scouts attend camp with their own pack leadership or parents. The program is staffed by volunteer leadership who are trained in the area in which they are assisting. Scouts BSA youth are also encouraged to help at camp as Den Chiefs (they must be 14 years old and be a First Class Scout to assist. Each day camp is different in location and program but follows the same theme as the rest of the camps in the Council. Each of our seven geographical districts will be offering a camp, and Scouts can attend any camp (or camps) they choose. Cub Scouts and potential Cub Scouts that want to attend day camp in another area are not only allowed but encouraged. Boys and Girls that are not already in Cub Scouts should contact David Harris at David.Harris@Scouting.org or 573-449-2561 Ext. 203 to get signed up for Cub Scouts before trying to register for Day Camp. Day Camp cost for 2019 will be $60/Scout ($30 for the 1-day camps in Black Diamond & Mark Twain). An early-bird discount will apply for registrations received by May 3rd ($10 discount for Boonslick, Grand Prairie, & Kinderhook camps; $5 discount for Black Diamond & Mark Twain camps). Registration for these camps will close on May 20th. For Five Rivers & Osage Trails camps, the early-bird discount of $10 will apply for registrations received by May 15th. Registration for those camps will close May 27th. Registration fees cover all programs, a camp t-shirt (for Cubs and an event patch like you see above! Extra youth shirts and shirts for walking leaders are available for $8. Registrations are ONLY being accepted online, but in order to save you additional fees, payments are to be sent to the council office. REGISTRATION WILL BE LIVE BEGINNING FEBRUARY 28TH. Registration deadlines vary by camp location. Click the camp link below to go to the registration page. Contact David Harris via email or at 573-449-2651 Ext. 203 with questions or concerns.